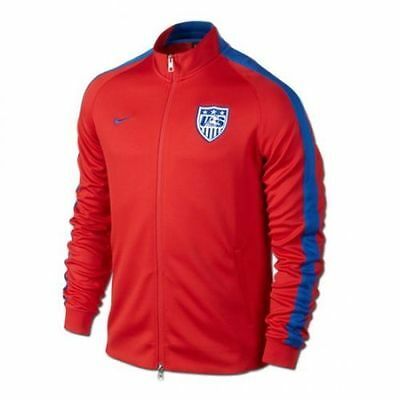 NIKE USA AUTHENTIC N98 JACKET Red/Blue. NIKE USA AUTHENTIC N98 JACKET. 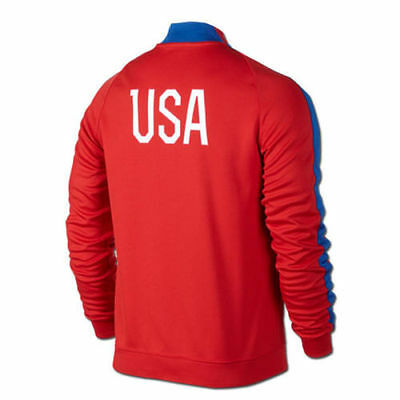 The USA N98 Authentic International Men’s Track Jacket features the colours and crest of a global football power. Raglan sleeves and rib trim deliver lasting comfort and warmth before and after the game. Designed for sport and crafted for life, the N98 (short for National 1998) originated as a tribute to the 1998 Brasilian National Football Team. Since, it’s been perfected by Nike Sportswear, and today it exudes sophistication and style. Posts related to NIKE USA AUTHENTIC N98 JACKET Red/Blue. NIKE BRAZIL AUTHENTIC N98 JACKET Royal/White. NIKE FC BARCELONA AUTHENTIC N98 TRACK JACKET Loyal Blue/Noble Red. NIKE BRAZIL AUTHENTIC N98 JACKET Blue/White. NIKE USA AUTHENTIC N98 JACKET Loyal Blue/White. Previous: NIKE FC BARCELONA YOUTH TRACK JACKET 2014/15 FOOTBALL LA LIGA SPAIN BOYS. Next: CAROLINA PANTHERS SALEM SPORTSWEAR SWEATSHIRT, 2XL, TEAM NFL, MADE IN USA, NWT.